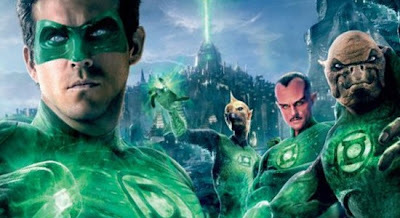 The planet Oa is the home of the Green Lantern Corp. A collection of intergalactic warriors whose job is to keep the universe safe. The immortal guardians created the power ring that is sustained by the ring's wearer's imagination and strength of will. The greater the will power the more effective the ring. The weakness of the ring is fear in it's wearer as it makes them susceptible to the yellow power of Parallax, once a guardian that fell to the power of fear while trying to control it. Parallax has escaped it's prison and seeks to destroy the universe. Abin Sur had once captured Parallax takes a team to capture him again, but they are over come. He manages to escape and crash lands on earth. He releases the power of the ring and tells it to find a candidate. Hal Jordon is a hot shot test pilot for the US Air Force working with his Carol (Blake Lively) sometime girlfriend, pilot and vice-president of Ferris Aircraft. His father was a test pilot too but died during on an exercise that Hal as a child had witnessed. Fearless and reckless he loses a plane when he loses concentration thinking of his dad. Later, he's encompassed by a green bubble that takes him to the crashed spaceship where Abin Sur's (Temuera Morrison) last words was to inform Hal that he's been chosen. While playing with the ring Hal ends up charging it and gets rocketed through a wormhole to the planet Oa where he's introduced to his new fate. Unfortunately the guardians believe that humans are too young for such a responsibility and Hal is still full of fear and doubt. The government takes the body and ship to a secret location and brings in Hector Hammond (Peter Sarasgaard) as a xenobiologist to do an autopsy. Senator Robert Hammond (Tim Robbins) the smarmy man in charge who doesn't think highly of his son Hector and Hector knows it. Abin Sur's body affirms his life long belief in extra-terrestrials. But an accidental contact with Parallax's energies hiding in the Abin Sur's body causes some changes in his head making him look like the kid in Mask, and he now has the ability to read minds and he has the power of telekenisis. With Hector reeking havoc with his new abilities, Hal comes back to earth after being told the Corp will not help, that he alone has to save the universe. The director of Casino Royale, Martin Campbell knows his way around action scenes. There were 4 screenwriters involved Greg Berlanti, Michael Green, Marc Guggenheim, and Michael Goldenberg. There are some amusing moments, and Reynolds does fill out the green uniform really well. He has really nice chemistry with Blake Lively who was trying to give her character more substance, but really had no where to go. Peter Sarasgaard really eats up the screen as the deformed demented Dr. Hammond. Hal is trained on the planet Oa by characters that could have lived in the Star Wars movies, Tomar Re (Geoffrey Rush) and Kilowog (Michael Clarke Duncan). The dialogue was simple for the young families that will attend this film. It would have been nice to have maybe an hour more to develop the characters so that you actually care what happens to them. Angelia Bassett as Dr. Amanda Waller has very little to do, and Mark Strong as Thaal Sinestro just recites platitudes on the way of the Green Lantern Corp. The first part of the movie is filled with exposition that is a bit cheesy with the whole green power of will keeping the universe together and that is represented by yellow. Yet with all this talent and cast the film is just OK. Nice, entertaining, ultimately forgettable.